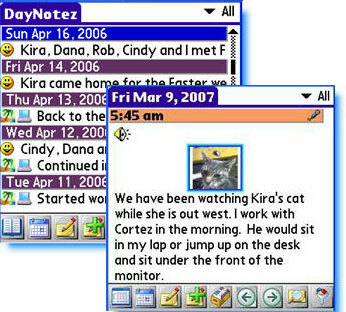 Touted as a 'business and personal journal for the Palm OS or Pocket PC,' DayNotez is a powerful companion to your handheld's built in diary application. Tailored for documenting and organising daily notes, thoughts and memos, the program lets you add multiple entries every day and add photos and voice memos to your text notes, with the option to synchronise the content with your desktop. 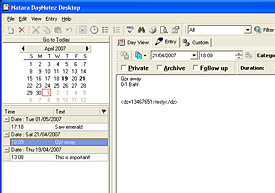 Loading up DayNotez on the Treo, the program presents a fairly simple interface with a row of icons running along the bottom of the screen and the choice of four views for entries (Journal Page, List, Calendar, Edit). Navigating around the screens is made easy by program's full support for the Treo's 5-way controller. Making a new memo is simply a task of clicking on the appropriate icon and typing away, with DayNotez automatically time stamping the entry. Photos and voice notes can be easily added to each entry, and appear on the relevant pages as an image thumbnail and small speaker symbol. The program usefully allows simple text formatting - bold, underline, colour, bullet lists and horizontal lines - as well as supporting URLs and links between notes and templates. There's also a time tracking feature with the ability to generate statistics and a pie graph for review and export. Entries can be assigned to address book contacts, and then organised and filtered using tags and colour coded categories, backed by full search capabilities. Old PC users keen to relive that authentic Windows95 experience will no doubt warm to the vintage lines of the desktop application which synchronises content on the handheld. Although text notes and voice memos are all accessible via this interface, you can only view linked photos by firing up the Palm desktop application which seemed a bit of a swizz. It has to be said that we found the desktop app so horrible to gaze at we weren't inclined to spend much time looking at it, although in fairness to the developer - who has been superbly responsive - a new version is apparently waiting in the wings. If you're looking for a highly configurable journalling/note taking program that can be made to fit the way you work, DayNotez provides a flexible and powerful solution. We liked the way you could easily add sound and pictures to text entries, and the ability to hot-link between pages opens up loads of creative possibilities. The program does take a little getting used to, mind, and the interface, although practical, isn't the slickest thing we've ever seen gracing our handheld. The inability to view images on the desktop was a frustration, and - it must be said - the Desktop application was supremely ugly and unpleasant to look at. 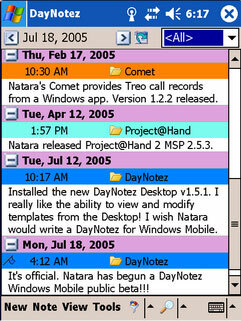 But as a fast, flexible, multimedia mobile note taker, DayNotez proved to be a great companion. We could see it becoming a must-have app for students, researchers, note-takers - or just about anyone looking to quickly write down and organise notes and reminders - and can warmly recommend you give it a go. 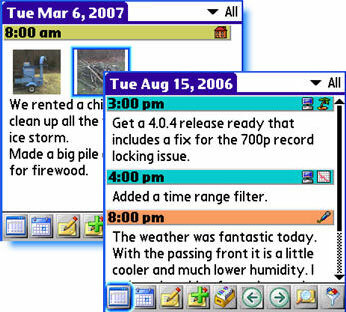 DayNotez v3.0.1 Palm (v1.1.4 Pocket PC) retails for $20, with the PC destop version costing $35.